In promoting an intellectually deep, emotionally charged drama whether in a book, a movie or a stage play, there’s no better slogan that a publicist can adopt than “You’ll laugh! You’ll cry!” Yet from easily the best documentary film released so far this year, the most that you can say is that you’ll cry. There is considerable humor along with the melancholy on display from our country’s most entertaining documentarian, Michael Moore. But from the first riveting scene to the final compelling words, you can’t be blamed for wanting to cry your eyes out. And that’s the strong recommendation one can make for this film. When Andrew Cuomo campaigned for re-election as New York’s governor, one who would “stand up to Trump,” he stated that the slogan “Make America Great” is a falsehood; that America was always great. Not so, Moore would reply, America was never great. And that’s where the tears can flow, because from the penning of the U.S. Constitution by rich white male slave owners, giving us the absurdly undemocratic electoral college, our country has had to struggle to make inroads resonant for all the people, not just the billionaires and not just for rural folks who make the big mistake of thinking that Trump will solve their money problems and not go rogue by blaming race and immigration. Still, most of Moore’s animosity goes to the Republicans, especially people like Rick Snyder, a reactionary governor of Michigan, who made nice with corporate power by building a pipeline that would bypass the pure water of Lake Huron to a separate, corroding line,that poisoned the output to the most poor, mostly African-American community. Trump is the obvious principal target of Moore’s scathing criticism, so demonic that the doc plays archival film of Hitler with Trump’s voice replacing that of the last century’s most evil monster. You would not be entirely wrong if you thought that this was overkill, that the “It can’t happen here” now longer applies, but there is an eerie sense that the rallies that Trump conducts, his preferred means of communication to his base coupled with his avoidance of press conferences, are a prelude to total dissembling of even what has passed for democracy in our union. Perhaps his most controversial view is that the reason so many registered voters stayed home on that fateful day in November of 2016 is not apathy or laziness, but a giving up, a surrender to the idea that standard politics is so demented, so unrepresentative, that there’s nothing anybody can do. In that regard, Bernie Sanders comes across as Moore’s hero, a fellow who, unlike Trump and unlike Hillary Clinton, tells it like it really is but gets shafted by the Democratic National Committee intent on giving Hillary the nomination. Yet there is hope. Look at what’s going down in some of the red states. In West Virginia, teachers are so fed up with their miserable wages, with their need to take two and even three jobs to make ends meet, that they succeeded in striking for five days and winning the reasonable raise for which they asked. As though to nail home points that might have seemed peripheral to the anti-Trump camp, he virtually calls the president a perv, showing a succession of pictures with Trump and his daughter Ivanka at various states in her growing up giving each other affection that might look as though a rich boss is cavorting with his young secretary. It did not help the president to say that if Ivanka were not his daughter, he would be dating her. In Stanley Kramer’s movie “On the Beach,” a nuclear bomb has exploded in the North, the radiation heading toward Australia which is still habitable. The final scene shows a Salvation Army street poster with the hopeful message, “There is still time…Brother.” Is there? Are we headed—like climate change—to the point of no return, or can we avoid the mistakes made by Germany’s progressive Weimar Republic when 32% of the electorate voted for the Nazi Party? If the American voters turn out in great numbers, the Democratic Party victories would be shoo-ins, since after all, we are a left-leaning nation with a majority favoring Medicare for All, proper regulations of guns, free public colleges, and reproductive rights. Or so Moore says. There is much to ponder in a film that makes its 126 minutes pass like an entertaining look at an America currently in a dystopian free-fall. 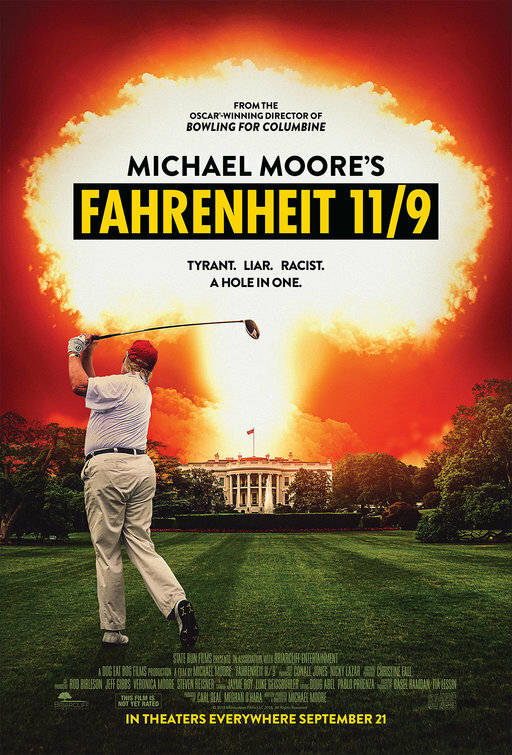 Michael Moore’s hard-hitting, hard left project has not a single dull or irrelevant moment and, like Bob Woodward’s latest book “Fear” is a clearly-reasoned, cleverly edited broadside punctuated by the year’s most awesome musical score.